During prince Djem’s peregrinations, first in France and later in Italy, Mourad, his odest son, is instructed in Rhodes, at the demanding school of pages of the great master. The Knights mainly teach him weapons, language and medicine; he converts to Christianity and takes the name of the greatest apostle, Peter. In November 1489, a delegation from Monk Island reaches the Vatican. Besides numerous knights, it includes an officer of Bayezid, who carries a letter for the prince, but above all his son, who is fourteen years old, and has not seen his father for twelve years. Djem, lit up by this reunion, feels reborn. The reason will discover in « Djem, a tormented Prince » how, much later, Peter, because he was Djem’s son and on account of his apostasy, was strangled to death with two of his sons by Soliman the Magnificent, grand-nephew of Djem. However, most fortunately for posterity, Peter had begotten two more boys: the princes Peter Oshin Sayd, born in Rome in 1500, and his brother Nicola Sayd, also born in Rome in 1505. Several thousands of Djem’s known of descendants can be counted since the end of the fifteenth century. Scattered around the globe, more or less direct cousins of his can be found in Australia, in the United States, in Malta, in Scotland and in Russia among other countries…note that all noble families in Malta, as numerous as they are, are in fact descendants of Djem’s. 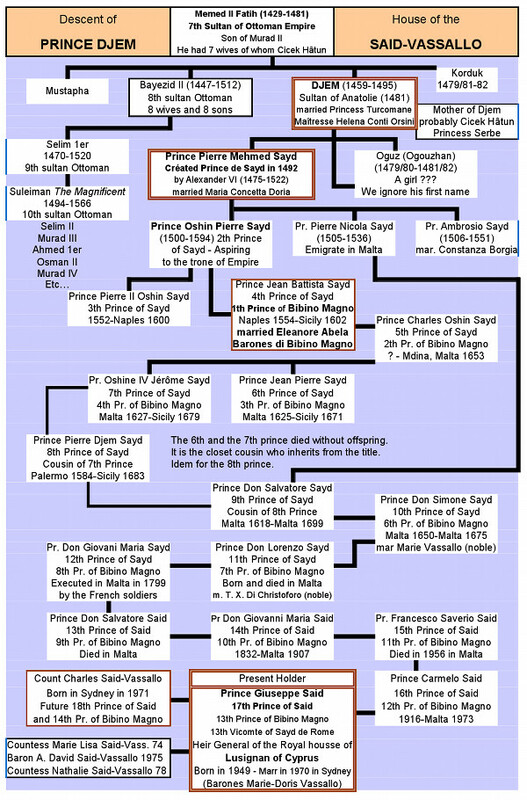 To learn more about Prince Djem’s descendants or the present family of the Princes of Sayd, please follow the links to Count Charles Vassallo’s page, as he is in charge of the genealogy of the noble Maltese families. Tonight, pope Alexander the Sixth organizes a special reception in the Vatican. Numerous cardinals and other prelates are invited, but also many princes and ambassadors, representatives of many European countries in regular relation with the Holy See. The guests of honour are Djem and his eldest son Mourad, who has been given the name Peter by the Hospitallers, and who has lived in Italy for two years. Indeed, this ceremony has been planned to bring to the Prince’s children, and particularly Peter, the legitimation of their father’s titles of nobility. « That said recognition is also conferred to your heirs, for the future and forever, we, Alexander the Sixth, have the honour and the privilege to recognize and acknowledge this day your noble descent of the Oghouz dynasty, of royal and imperial blood, and to create a new title of nobility. « This title will be strictly bestowed to all your descendants raised in Christian faith, given perpetually and by order of primogeniture to all male heirs of your blood, as long as your lineage will last. The title given by us allows the prince Peter Mehmet Sayd, and well as to his oldest son and his future descendants, to sit on the throne of your father and of your father’s father. Djem takes the precious document from the hands of the pope, whom he embraces, the way he is now used to do it, in spite the etiquette and every standard of behaviour, but no one in the assistance, and Alexander even less, seems to mind. Very moved, Djem stammers a few words of gratitude. When Peter’s turn comes to pay homage to the Pope, he kneels down in front of the Holy Father and, being a good Christian, after having kissed his foot and his hand according to the customs of non-believers, he thanks him, with a slight lump in his throat due to the importance of the event. Dawn, riding its star, will come take me away. Glory is my servant, and Prior is my lackeyShe will stand still when Zizimi sits. Tenth century As they meet the persian dynasty of Samanides, the Ouigour Turks convert to Islam. Around 1040 The Seldjoukide tribe reaches Asia Minor. 1055 The caliph of Bagdad calls for the head of the Seljoukides, Toghrul Beg, to protect his city. Toghrul becomes the caliph’s protector, who awards him the title of Sultan, and whose daughter he marries. Twelfth century The Seljoukides found a strong state, with Konya as its center, on the plateau of Anatolia. The invasion of the Ilkhân Mongols, heirs to Gengis Khân, leads to the decline of the seljoukide turkish sultanate. The turcomane tribes found independent emirates. Around 1260 Reign of Ertoghrul According to the legend, Ertoghrul receives the region of Söghüt with the mission to defend it against the Byzantines. Conquest of northern Phrygia and eastern Bithynia. 1324-1362 Reign of Orkhân 1326: Storming of Bursa (Brousse), which becomes capital of the Ottoman Empire. Storming of Nicea (Iznik) during march 1331. 1362-1389 Reign of Murad the First First great Ottoman conqueror on the European continent, he benefits from rivalries between Constantinople and Rome, and between Venice and Genoa. 1365: Erdine becomes the new capital of the Ottoman State. 1389, 15th of June: during a battle in Kosovo, Murâd the First is killed. Bulgaria falls under Ottoman control. 1389-1402 Reign of Bayezid the First, nicknamed « The lightning » The Empire, firmly established in the Balkans, owns suzerainty over Serbia, Bosnia and Valachia. 1395-1397 : Siege of Constantinople. 1402, 20th of July: Near Ankara, victory of Tamerlan over Bayezid. Taken prisoner, Bayezid dies on the 8th of March 1403. 1413-1421 Reign of Mehmed the First Tchelebi Restoration of the borders of the Empire as they were before 1402. 1421-1444 & 1446-51 Reign of Murâd the Second 1430: Conquest of Thessaloniki/Saloniki. 1446: Conquest of the Peloponnese. 22nd of december: birth of Djem, 3rd of the 4 sons of Mehmed the Second. Djem’s mother is most likely the Serbian princess Cicek Hâtun. 1451-1481 Reign of Mehmed the Second Djem’s father nicknamed Fâtih, (The Conqueror) after the storming of Constantinople on the 29th of may 1453. 1458: Settling of Mehmet the Second in Istanbul, Which becomes the capital city of the Empire. 1458-1459: Conquest of Serbia, except for Belgrade. 1461: Conquest of the ports of the Black Sea (Trébisonda). 1478: Albany becomes an Ottoman province. 1480: Siege of Rhodes and expedition to Italy (Otrante). May the web user as well as the reader forgive us for the always possible small mistakes. As an example, in the book, Prince Guiseppe Said, presently Prince of the family and father of Count Charles Vassallo, is indicated as being the twelfth Prince of Bibino Magno. He is in fact the thirteenth, and the table above therefore is the one to go by. (From France), you can also order it from your book store. We bring to your attention that the book has only been published in French for now. . The author, Maurice Caron, signed a Chronologie des Hospitaliers in 2006.